One of my favorite things about summer approaching is getting to see all the fabulous new shoes that come out at the beginning of the season. From wedges to pumps, flip flops to casual sandals, it amazes me how designers keep coming out with styles that are new and exciting! When looking for new shoes for summer, I have three goals I try to accomplish with each new season as discussed in Fabulous Finds from 04/24/2013. One of those goals is to find a pair of sandals that can be worn casually or dressed up, depending on what I wear them with, but are still comfortable and cute. Comfortable has always been key for me because I am on my feet a lot and have bad ankles so I can’t wear something that is impossible to be worn or stood in for most of the day. This week I was able to pull out one of my favorite pair of metallic sandals from last summer. 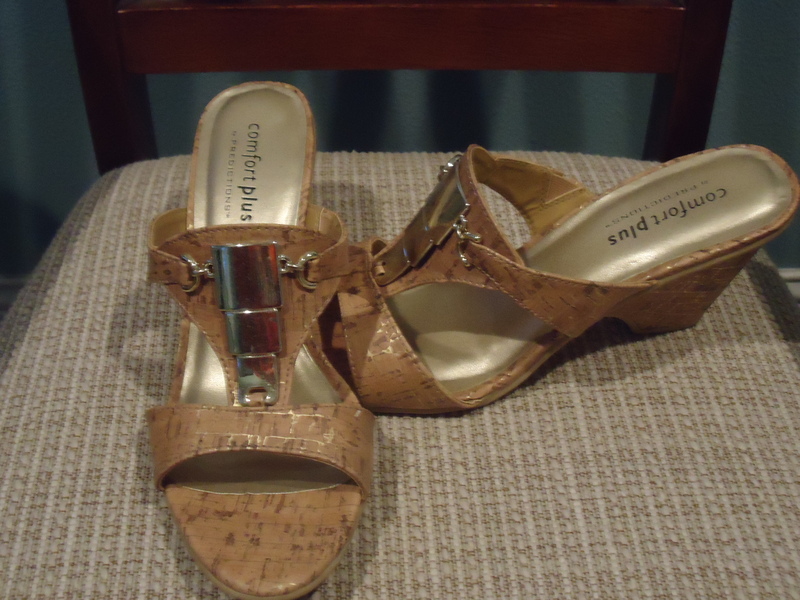 A pair of heeled sandals made by Comfort Plus. These were the perfect sandals to wear for a dinner date with some of my favorite girls. And does the name “Comfort Plus” fit them! At the time I purchased these, I was teaching in a 6th grade classroom. I remember when I spotted them in the store, I thought there was no way these would be comfortable enough for me to wear throughout a whole day of teaching. Once I tried them on, I was sold. They felt so good on my feet and were adorable. I wore these many times during May last year in my classroom, and my feet never bothered me. I actually found these shoes at Payless for less than $20. When worn with a fabulous outfit, they look like they would have cost much more than this. I’ve also been impressed with the quality. I wore them MANY times last season, and they still look new. They can be worn casually or dressed up. With the little bit of metallic “bling” they have on them they give even the most casual of outfits a little edge. I wear mine with shorts, bermudas, skirts, and capris. Love them! They also elongate the leg and give them that little extra shape that makes it look like I’ve spent hours in the gym…or doing Insanity 🙂 …which I like! For 2013, Payless came out with the same shoe by Comfort Plus with a little updating. I love the new style. They are very much like the ones I already own with just a little tweaking. On sale for only $19.99, these sandals are a steal and would be a fabulous compliment to all those summer outfits already in your closet! Available in 5 different colors for only $19.99!